Pumpkin Pie and Snickerdoodles? You read it right. Who would think to combine them- but that’s just what this recipe does. Ingenious. 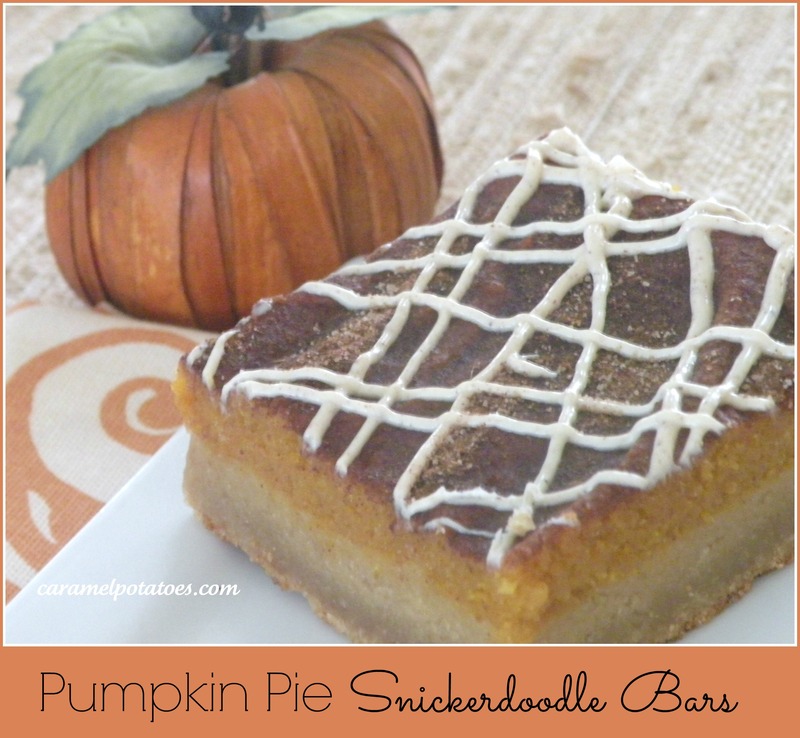 One bite and you have the familiar taste of snickerdoodles coupled with the creamy goodness of pumpkin pie. 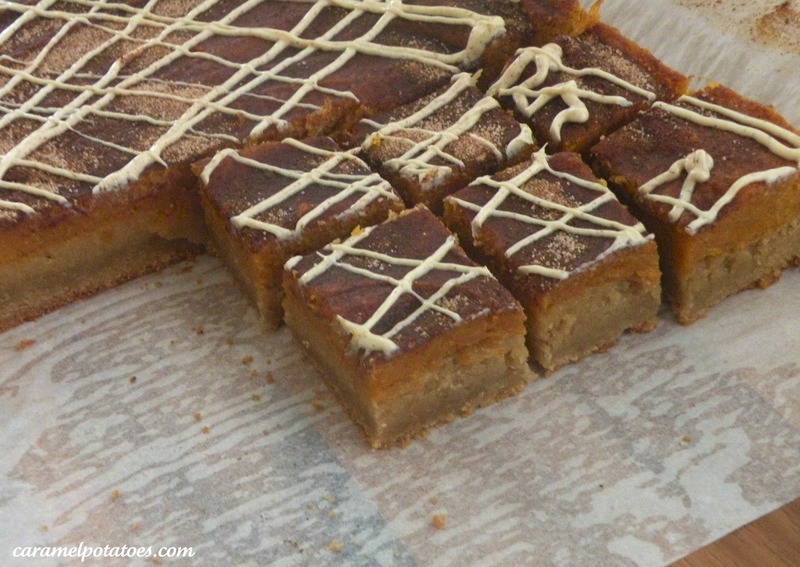 Give these bars a try and you’ll wonder why you didn’t think of it yourself! In a mixer bowl (you can use the same one you used to make the snickerdoodle batter) with a paddle attachment, mix together all ingredients until well combined. Pour over the snickerdoodle layer, smoothing out the top. Combine white sugar and cinnamon in a little bowl. Evenly sprinkle cinnamon sugar mixture over the top of the batter. Bake for 33-40 minutes (maybe more depending on your oven) or until a toothpick inserted into the *center* of the pan comes out clean. Let the bars cool completely (about an hour). They will deflate a bit and remain a bit pie-like on the top layer. The bars that are closer to the edges of the pan will be more firm, but are still equally as yummy. After the bars are completely cool, place the chopped white chocolate into a bowl or zip-lock bag and melt on low power. When it’s completely melted, add the pumpkin pie spice and mix (or knead if using a zip lock bag). Use a spoon or cut a small corner off the bag and drizzle the melted chocolate over the top of the bars and let it cool and harden. Use the parchment paper to lift the bars out of the pan. 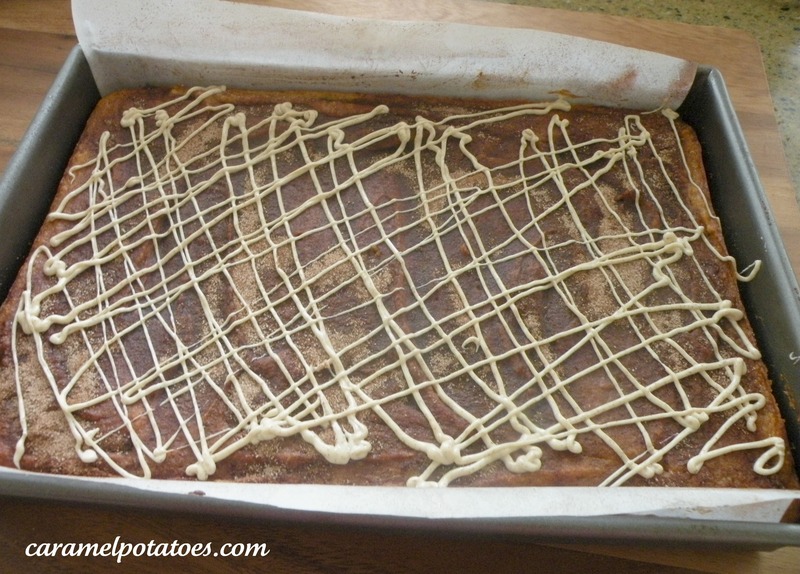 Place on a cutting board and cut into bars. Store in a covered container. YUM – you love this holiday makeover! This recipe looks so yummy! Love your signatures!! I made these last night for a work party but put cream cheese frosting on top since I don’t like white chocolate and it was YUMMY…great recipe!! Just wanted to say thanks for the recipe. I made these today for a potluck at church and they were a huge hit.